Strongly Worded Letter: I Miss Baseball! 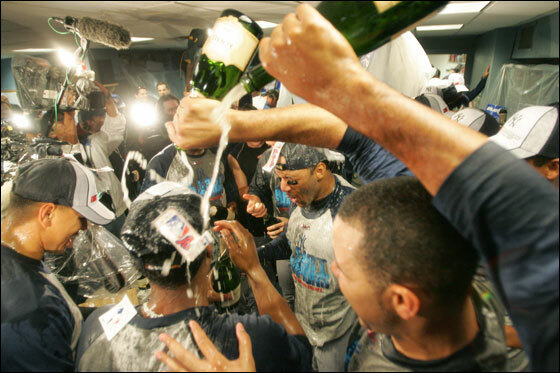 That was the scene in the Phillies' clubhouse yesterday after improbably clinching the National League East and good for them. Even with the Mets' historic collapse Philadelphia still had to nearly win out in the last two weeks of the season to make the playoffs. I surely would be enjoying this week if I were a Phils fan, or an Angels fan, or a Red Sox fan, or...you get the picture. But loving the Seattle Mariners is my curse and Safeco Field is all buttoned up for the winter starting today. The lockers are cleaned out and the players' personal belongings are in Fed Ex planes right now going to the Dominican Republic, Japan, and even exotic Ohio. As disappointing as it is to not make the playofffs again this year what keeps fans like me coming back every spring is that we believe that winning the World Series is a dream that is truly within our team's grasp. There was a lot to be pleased with this season. 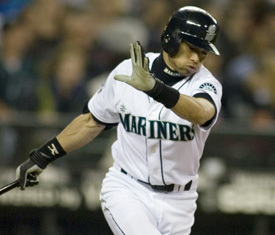 We re-signed Ichiro Suzuki, who just batted .351, to a multi-year deal. 22 year old starter Felix Hernandez showed us he can be the ace of this club for a long time to come. Pitcher Miguel Batista won 16 games. Young players like Adam Jones, Jamie Burke and Jeff Clement all made real contributions in the last weeks of the season and could do even more next year. Seattle has the fifth best record in the A. L. and ended up second in the American League West and ten games ahead of last year's last place finish. Yeah, it's going to be a long winter. Congratulations to the teams and the fans who still have games that matter to them still to be played. Me? I already can't wait for 2008.